This photograph is dated 8 April 1973; it shows the corner of Lewes Road and Aberdeen Road. Twitchin’s the grocers had occupied the corner shop for more than 70 years. Do you remember this shop? When did you shop there? Do you remember any of the grocery prices? If you can share your memories with us, please leave a comment below. If you do a search for Olive Sant you will see an article about “Flea Pit etc”. Responses include comments about Twitchin. I remember Twitchin’s Stores very well from the early 1950s. 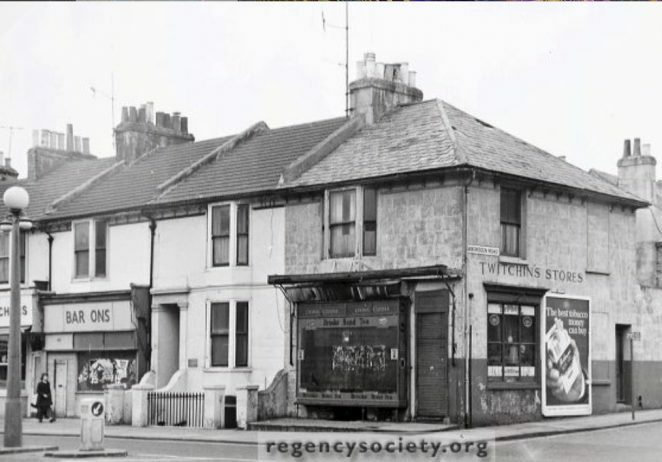 I lived in Totland Road and every Monday Mum and I would walk down to Twitchin’s to place our grocery order or rations as it was known in those days. They would be delivered the next day by a boy on a bicycle. This must have been the first home delivery service! Unfortunately I can’t remember if there was a charge for it. I remember Mr Twitchin always wore a white grocer’s apron and if I was very good he would give me a broken biscuit to eat while sitting on a very high backed chair by the counter. Mum’s shopping list never varied and always started with tea, sugar, marg and eggs. Sugar was weighed out and placed in blue cone shaped paper and butter, marg and cheese was always cut to size on a board and then wrapped in greaseproof paper. When we’d finished sorting out our shopping list Mr Twitchin would accompany us to the front door of the shop and Mum and I would begin the long homeward trek up Hartington Road- there were no buses in those days! I remember Mr Twitching, he had white hair and a bit of a hooked nose and he wore a white apron which was buttoned to the bottom of his waistcoat. He used to carve ham off the bone which sat on a white China pedestal. I worked at Allen West in the 1970s. I worked with George Roser who before the war as a boy worked for Mr. Twitchin. George retired from Allen West in 1974. Sadly, he died shortly afterwards. I believe there was another grocers opposite called Tofts. I remember Twitchin’s store from the time I worked at the Westminster Bank in Lewes Road in 1970. Mr Twitchin was a friend of my grandfather Charlie Goldring and his brother Ernie owners of the bakery at the bottom of Bear Road, (joined to a grocers). They were there in 1911, and probably before that, until about 1945 I think. It was still in the family but leased out until the 1960’s but as a cafe in later years as far as I remember. I am surprised that no one has remembered this bakery as it was a very busy place in those days and employed several people. My grandparents lived above the shop for many years before moving to Lower Bevendean Avenue.